1. Never wear nylons in a swamp. If only I had known that chemical plants aren’t nice air-conditioned buildings, but just a jumble of pipes sprouting out of the ground, I would have never worn typical office wear of dress/nylons/heels to the grand opening. After a day of sweating in 90-degree, 100% humidity, my legs felt like encased sausages. 2. Perfect the interview look. When I got my 10 minutes to interview a big-wig executive, I furrowed my brow and nodded vigorously even though I didn't understand a word he was saying due to his thick German accent. Thankfully, I held onto dear life the press kit that contained all the information I needed to write the story that would somewhat legitimize this junket trip. 3. When it’s all over, go native. Once I was on the plane heading back to Mexico City, I forgot my aching legs, and turned off the “why didn’t I ask that question?” tape running in my head. 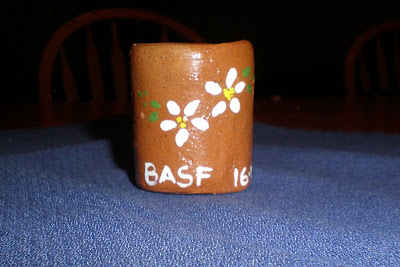 Instead, I followed my fellow Mexicans' lead and poured myself a shot of tequila into the cute ceramic shot glass BASF so thoughtfully gave me as a parting gift. I was picturing a nice air conditioned building, too! LOL, I can just imagine you traipsing through the swamp in pantyhose! That's a lovely memento you have there. Have you had tequila in it since then? I'm always wondering why I missed a certain shot, or didn't use the natural lighting more to my advantage after a photoshoot... but you are right, it can drive you mad - better to roll with it. This post and the pic are so impossibly adorable that I've been speechless -- uh, commentless -- for days now. I love that shot glass! And one of my bosses also has a thick German accent! It really took me some time to get used to it so I could understand what he was saying.